Scientific name: Falco peregrinus. Falco, the genus,from the Latin falx, means sickle-shaped. This may refer to the shape of the wings in flight or to the talons or even to the beak shape. Peregrinus, the species, comes from the Latin for traveling or wandering, a reference to the migrations of the birds. Common names: Now generally known as the peregrine or peregrine falcon, the birds also have been referred to as duck hawk (a primary prey is duck), bullet hawk (the birds are very swift), wandering falcon (they migrate a long way), or the ledge hawk (the historic nesting habitat), among others. Falco peregrinus anatum is the most common peregrine in the contiguous United States (the lower 48 states) and southern Canada and is also called the American peregrine. The Latin word "anatum" means eater of ducks. This is the group that came close to extinction in the latter part of the 20th century. Falco peregrinus tundrius is also known as the Arctic Peregrine and the "tundrius" refers to the terrain of the far north  the tundra. Scientists believe that these birds were reduced by about 50 percent during the 1960s and 1970s. They were removed from the "threatened" list in 1994. 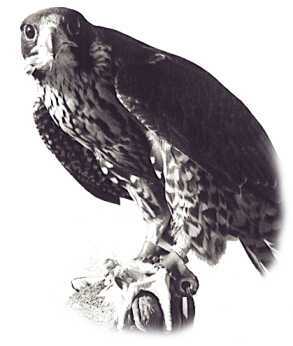 Falco peregrinus pealei, or Peales peregrine, named for Titian R. Peale, an early 19th century Philadelphia artist, is found mostly along the Northwest coast of the United States, the western coast of Canada, the Aleutians and the Bering Sea. This maritime species does not migrate and was not as severely affected by man-made chemicals. Hybrids, due to captive breeding programs, are now more common.